Another Grundorf original design! The Grundorf Plastic Front DJ facade has everything you have always wanted in a great facade. Now the setup can look as professional as the DJ. Hide your gear behind a facade that conceals the LED lighting fixtures while allowing the light to glow through the facade. The wood frame construction is finished with a durable, textured paint. The opaque white acrylic panels provide the glow from your favorite LED lighting. 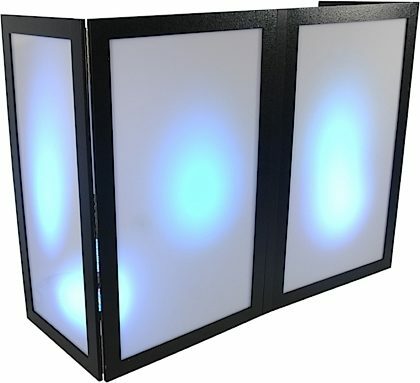 The tough, impact-resistant, acrylic panels are also scratch resistant and opaque to conceal your DJ equipment. It's easy to clean -- just use soap and water. The plastic panels are field-replaceable. - Care and Cleaning of these panels: Clean only using a soft cloth or sponge and mild soap and water. Never use abrasive cleaners or cleaners that contain chemicals. Never use Scotchbrite, or Brillo pads, etc. They may harm the finish on the panels. - CAUTION: Never expose to heat over 140-degrees F. Keep all heat sources 2-3 inches away from this product. - Product Dimensions (folded): (H x W x D) 48.13 x 31 x 5"
Overall: Not a very good product, not professional at all. Is made by rough wood and plastiglass, very heavy and uncomfortable to carry-on. 35 of 38 people (92.11%) found this review helpful. Did you?